A lone hiker makes her way on to an overhang near the summit of the Jabel Shams Challenge. more than 3,000 meters above sea level. 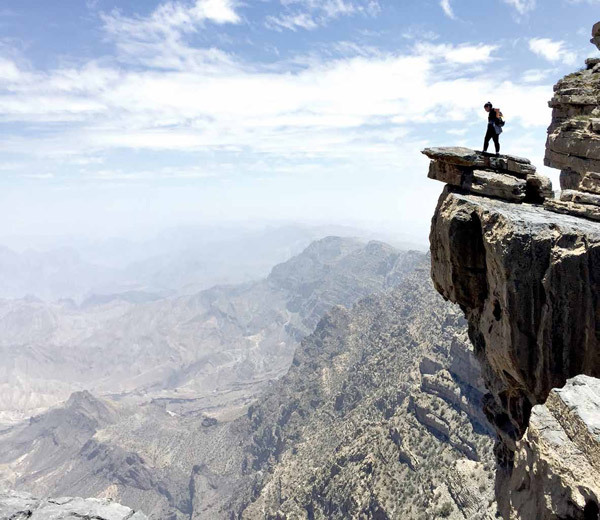 Muscat, Oman — Jabel Shams, in the heart of the northeastern region of Oman, is the highest point in the Arabian Gulf, reaching 3,009 meters above sea level. Last month, a group of more than 25 Aramcons arrived in Muscat to participate in a 10-kilometer challenge to hike up the striking Jabel Shams mountain peak, and back. Organized by a Kuwaiti adventure company, and supported by the Saudi Aramco Employees Association (SAEA), the “Jabel Shams Challenge” requires mind-over-matter thinking to successfully reach the finish line. As challenging as it may sound, the trip was open to both families with children and adrenaline junkies. For the little ones — and people who prefer to enjoy the scenery — the hike was 5 kilometers. Those wanting to test their endurance levels and reach the summit hiked the full 10 kilometers through leveled to steep mountainous terrain. As we arrived at the campsite, my fellow hikers and I were greeted by the beautiful contrast of the orange and green tents where we would spend two nights. The following morning, at 6 a.m., faces filled with anticipation and excitement as a group of 200 participants took their first steps to reach the summit. Participants — beginners and competitors, young and old, from neighboring Gulf countries and international locations — all came together with one objective in mind: conquering the summit. The ascent started with safety checkpoints at every kilometer, a clearly marked trail, and not knowing how far our feet would take us but all in agreement to aim for the finish. The relatively smooth five-kilometer start quickly changed as we passed Station No. 5 when the beautifully-colored trail with interesting rocks and friendly mountain goats became steeper. An overwhelming feeling of accomplishment and breathtaking views greeted us when we reached the summit, making the climb up worth every step. After completing the arguably harder part — the descent — participants were rewarded with burgers, medals, and warm showers in the camp. Trips like these give Aramcons a chance to experience something out of the ordinary, and offer a truly memorable experience.